Goya, a bitter melon or gourd, is a surprisingly popular vegetable in the UK, but you might know it better as karavella, karela, kugua, bitter gourd, bitter melon, korola, caraille, cerasee or kudret narı. This tasty vegetable is enjoyed in the Near East, Africa, Asia, South East Asia, the Caribbean, and South America. So you should be able to find it in most regional food specialist stores with a fresh vegetable section. Goya is also used in traditional Ayurvedic medicine so it can also sometimes be found in health food stores too. Goya recipes are often cooked during the summer in Japan because the goya, is said to beat the heat, among other purported medicinal and health benefits. Chanpuru is a specialty of Japan's Okinawa region and is a stir-fried dish made with vibrant green goya, soy sauce, tofu, pork, and egg. Chanpuru means mixed. Surprisingly the term comes from Indonesian word campur, which also means "mixed". 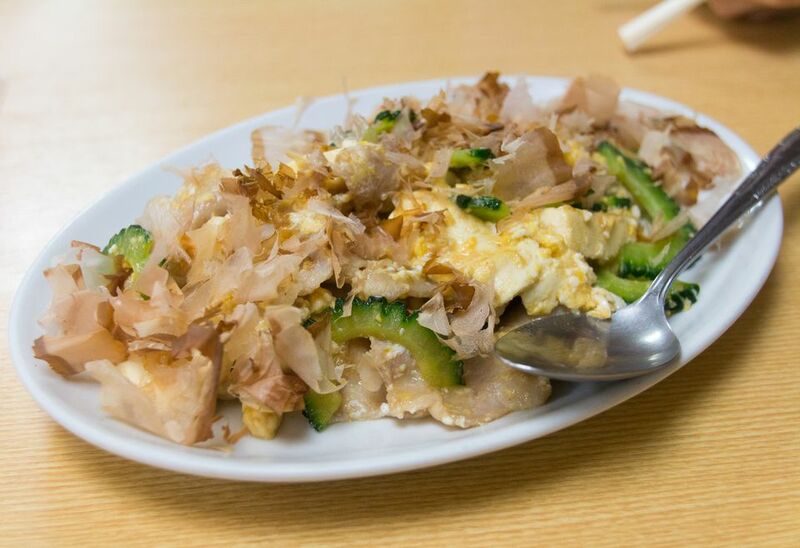 In addition to the goya itself, this recipe includes tofu and pork as its main ingredients. You can also add other vegetables of your choice, such as carrot, green beans, and bean sprouts just to name a few. Goya has a tasty, mild and bitter flavor, but if you’re not good with bitter tastes you can soak the bitter melon in hot water for 30 seconds before stir-frying. A dab of oyster sauce can also help to counteract the bitter taste. A quick search online about bitter melon reveals its known effective uses in medicinal applications, from treating infections to digestive problems and even type 2 diabetes and cancer. Surely eating this wonder fruit from a young age must help prevent one from even getting these sometimes fatal ailments to begin with. Tip: Try adding misoyaki sauce to the Goya Chanpuru. Here's how to make the sauce: 2 tbsp. miso, 2 tbsp. sake, 1/2 tbsp. sugar and 1 tsp. soy sauce. Cut the goya in half lengthwise. Slice the goya thinly and place goya slices in a bowl. Sprinkle some salt over them. Let them sit for about 10 minutes. Wash goya slices and drain well. Squeeze them to remove excess water. Heat about 1 Tbsp. of vegetable oil in a large skillet. Stir-fry pork and season with salt and pepper. Add goya slices and cook until softened. Crumble tofu into large pieces and add in the skillet. Lightly stir-fry with pork and goya. Season with sake. Pour beaten eggs over and stir quickly. Season with soy sauce. Adjust the flavor with salt.